One of the reasons that I love staying at Novotel Varun Beach in Vizag is the superb view of the seafront that it offers. And best of that view is from the roof top where you can see the vast expanse of the seashore as well as end to end of the busy beach road. The location qualifies as a sightseeing point in its own right. The added attraction on the rooftop is Infinity Bar and Grill, which serves some good continental food and heady cocktails. With both indoor and outdoor seating, and a glass partition separating it, you can have a majestic view from any point in the restaurant. 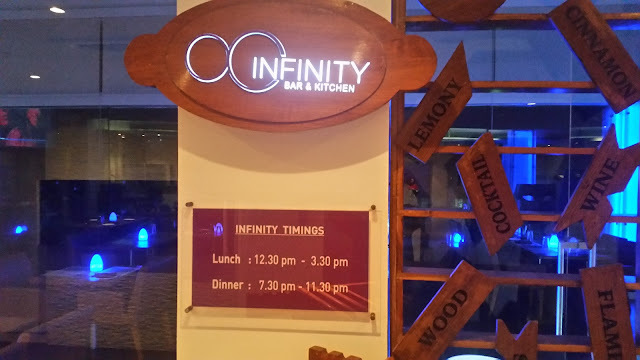 On my last visit, I came to know that Infinity has introduced a new barbeque and grills menu from the first week of March. During my stay at the hotel, I could taste a significant number of dishes from this menu curated by Executive Chef Moy and Sous Chef Utpal. The highlight of the new menu is the Barbeque section. 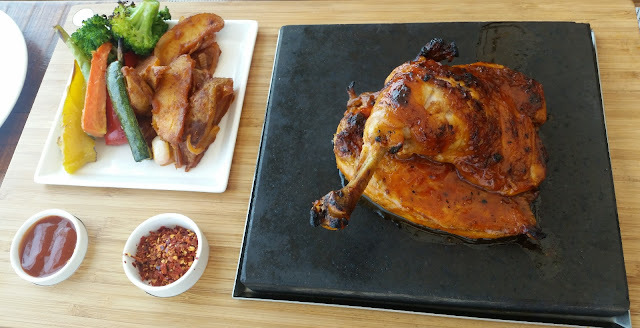 The Barbequed Chicken, which I had tried the last time, has had a complete makeover. The roasted chicken, a large portion of leg and breast, is done in a thick and spicy barbecue sauce. A very decent preparation where the chicken has absorbed the sauce well, and the accompanying potato wedges served with sautéed onions was a nice touch. As a pork lover, I could not miss out on the Rolled Pork Belly. Thick slices of pork were cooked in a special sauce. A must have dish here, maybe accompanied by a wide range of cocktails and wines available. The best among the dishes I tried was Southern Side Lamb Chops. The lamb is rubbed in pound garlic, giving it a very distinct flavour, which is then prepared in a special sauce. This is served with mashed potatoes and sautéed veggies. The lamb was perfectly done and definitely impressed my taste buds. Blackened Char Grilled Sea Bass was the fish item I tried. This was a Cajun spiced steak. While the sauce was good, the fish by itself had no taste of its own. The barbecue menu also has the concept of Catch of The Day where one can choose fresh seafood sourced from the seashore nearby, and this cooked be prepared using a choice of sauces. 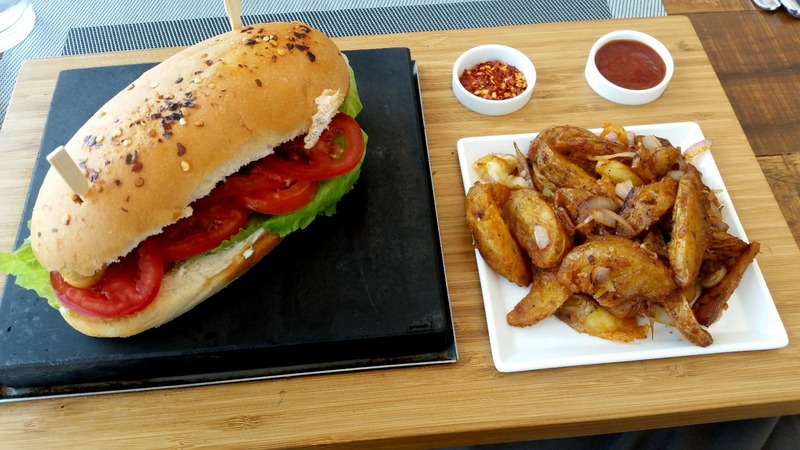 Infinity also allows the guest to play a part in the cooking with Guest Cooking on Steak Stone section. 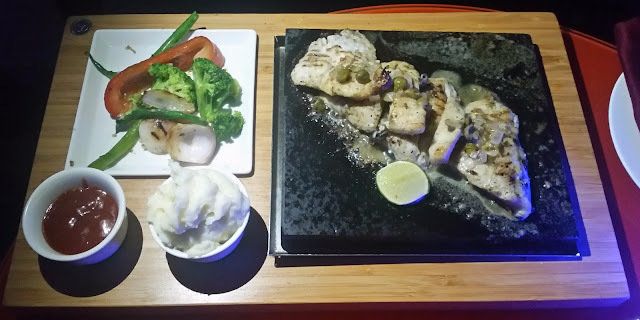 Here the hot stone is brought to your table with the non-veg course (chicken, tenderloin, paneer or a range of fishes) as well as sauces, spices and seasonings, and the guest can prepare his own meal. 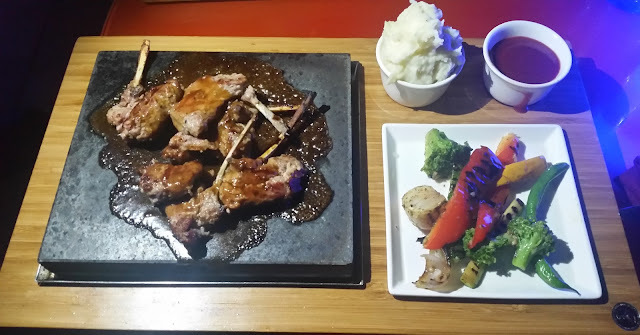 For lovers of Indian grilled food there is a section in the menu too – Gilafi on a Griddle and Coal Charred Jhinga being few of the highlights. If you want a quick bite, try the Sizzling Hot Dog. Barbecued chicken sausages and a host of veggies form the filling inside the hot dog bun. There are also wraps available. I had the Barbequed Wrap of chicken and vegetables, inside a whole wheat parathas. Though the seasoned chicken tasted good, the paratha could have done with a little less oil. Overall, a very interesting menu. One area of improvement may be an increase in the variety of dips served with the food, for a resident of the hotel it gets monotonous after a time. 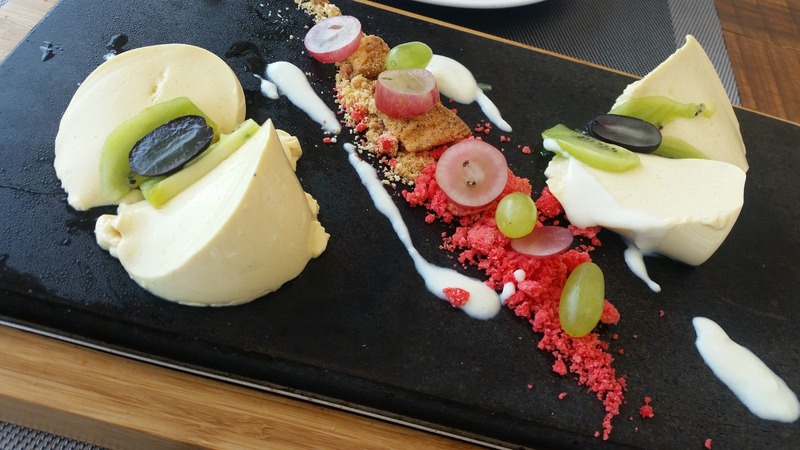 The dessert menu of the restaurant has also some interesting stuff. Mas Coff Ne was a take on Tiramisu with Mascarpone cream layered with coffee caramel sauce. 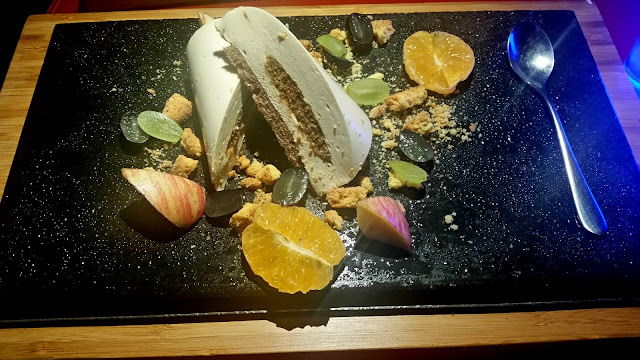 They have a Chaas and Kiwi Pannacotta which is a must try here. They also have twists to this recipe also, for example, one of the days I was served a pannacotta which was mango flavoured. It was a clear winner. There is lot of importance given to the presentation of the dishes too. All the dishes were droolworthy. 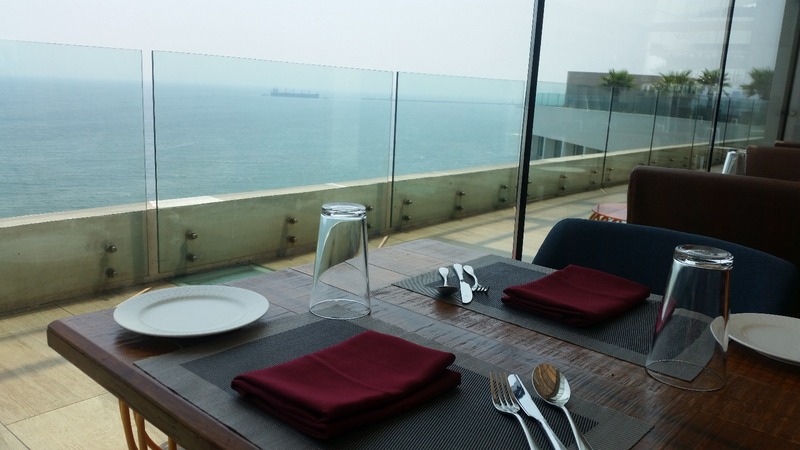 If you are in Vizag for business or leisure, a visit to Novotel rooftop is strongly recommended. And the food at Infinity adds to the charm of the beautiful view. Ask for Chef Utpal, and he will definitely help you in choosing the right items for you.